This map ownz joo !!! Ya it really owns pfffft. A bridge with some boxes and weapons and an easy escape route to return the flag...Yeah this really owns..
At first I hated this one but now that I have played it a while I really enjoy it. The bots are not the greatest in it. You can go low in the water and they prolly won't catch ya. However online this map is great. Three routes plentiful ammo and weapons. Plus it works with the strangelove mod. Sure single player this might not be the greatest but if you are going to host a server you might want to grab this. NOTE: There is a updated version of this called BigBridge2. This map is OK for strange love, not the best but i feel it desevers a five. "Nobody" is right. This is one Of the best maps on NC. Great visUals + Great gameplay = Great MAp! 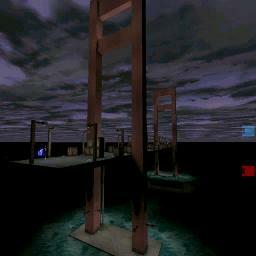 This is the best CTF map I've ever palyed. The cover is excellent, theres more than 1 way to get the flag. But my only complaint is there should be less redeemers. I enjoy playing this map, even with strangelove..., but it's not the best for sniping given the lack of ammo on the bridge! It's a basic concept nicely executed and makes for good gameply, but not one I like to visit too often.